More than a decade after talks began on reform legislation, the four bills which pave the way for local government polls were passed by the National Assembly last night. They now await assent by President Donald Ramotar and this is potentially a roadblock as the President has previously refused to sign some bills passed by the National Assembly or delayed the process significantly. The bills- The Local Government Commission Bill, the Local Government (Amendment) Bill, the Municipal and District Councils (Amendment) Bill and the Fiscal Transfers Bill are intended to allow for the holding of local government elections which were last held in 1994. This has long been called for by various society actors and the international community has piled pressure on the government to act. Huddle: One of the intense PPP/C huddles during yesterday’s deliberations on the order of business for the day. There was no indication from government speakers last night as to whether the polls will be held this year. Since being tabled last year, the bills have endured a rocky path with government and the opposition wrangling over the contents. 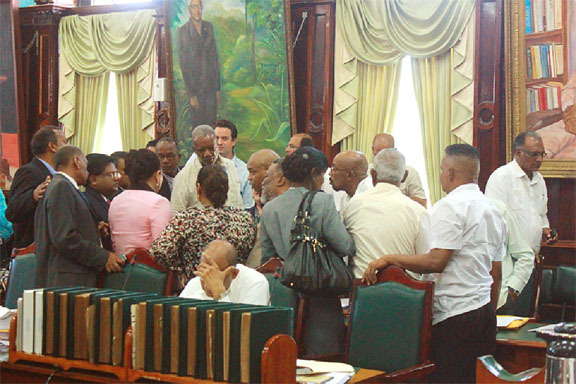 The government and opposition parties had previously agreed on the enactment of reforms prior to the holding of local government elections, which have been due since 1997. A bi-partisan Task Force on Local Government Reform, made up of representatives of the PPP/C and the PNCR, had worked for eight years on completing the reform legislation. However, in 2009 the government abandoned the process in favour of the parliamentary review. All four bills were tabled in that same year and sent to select committee for a review, however, the process stalled after the opposition parties withdrew their participation, saying that the government was “inflexible” on proposed amendments. The bills were re-tabled last year. 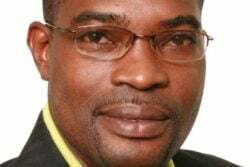 After being tabled last year and sent to a Special Select Committee, A Partnership for National Unity (APNU) MP Basil Williams, who chaired the committee, brought the bills back to the House on July 18th. However, they were deferred twice after Local Government Minister Ganga Persaud refused to take the reins on one occasion. They were deferred for a second time as the government attempted to leverage opposition support for legislation for the Amaila Falls Hydropower Project. Two of the Bills, the Fiscal Transfers Bill and the Municipal, and District Councils (Amend-ment) Bill, were passed largely without incident during yesterday’s sitting while matters relating to the remaining two – The Local Govern-ment Commission Bill and the Local Government (Amendment) Bill – had to be smoothed over before they could be passed. In the case of the Local Government Commission Bill, there was an issue relating to how many persons would comprise the commission. The original provision stipulated that the commission would be made up of six members; three to be appointed by the President, in accordance with his own deliberate judgment; two to be appointed by the President after he has consulted with the Opposition Leader; and one other member appointed by the Local Government Minister after he has consulted with local democratic organs. Williams had said that the government wanted to amend the number of members to eight. He said though, that this proposal was rejected by the combined opposition, who, instead decided that the commission be comprised of seven persons: three to be appointed by the president, three by the president after conferring with the leader of the opposition and one nominated from the trade unions in the area of local government by the parliamentary select committee on appointments. In justifying the opposition’s decision, Williams said that an even number on the commission was a recipe for gridlock. The opposition, through its majority at the select committee, voted to have seven instead of eight committee members. The government did not give up however, and last evening, after the bill was read for the second time, the government proposed that instead of seven members, the committee be comprised of eight persons. APNU voted against this amendment but when the division was called, the vote was 37-25 in favour of the amendment with the Alliance for Change (AFC) supporting the change. Speaking to Stabroek News during a break after the bills were passed, AFC leader Khemraj Ramjattan said that though the committee would be comprised of eight persons; four would be selected by the president while the remainder would be selected by the president after conferring with the leader of the opposition. Analysts say the AFC vote was likely as a result of an agreement with the PPP on a number of issues. Meantime, Persaud had also raised the issue of the powers of the commission. The minister said that the bill as completed at the level of the select committee, will give the commission the ability to hire, fire, as well as determine the remuneration of employees of local governing organs, a role, he said, is supposed to lie with the local governing body. Persaud said that this move would do the opposite of what the bill is intended to do – make local governing institutions more autonomous. sufficient cause.” Instead, the minister will now be required to consult with the leader of the opposition before such action is taken. Also, the member will be given an opportunity to provide a defence. Despite these qualms, including the amendment as it relates to the composition of the commission, all sides supported the passing of the bill. The Local Government (Amendment) Bill was also the centre of much debate. There were five clauses in the bill that did not find favour with the government side. Clauses 13 and 14 of the bill in particular seek to transplant several responsibilities which currently lie with the minister to the commission. For example, under the present laws the minister has the power to hire and fire members of local Neighbourhood Democratic Councils (NDCs) and municipalities. These provisions were amended at the level of the select committee and the opposition voted to strip the minister of these powers which APNU MP Ronald Bulkan referred to as “imperialist.” Bulkan, during his presentation said that the laws which gave the minister the power to make decisions in such a manner were archaic and out of place in a “modern democracy.” He said that all efforts should be made to make the local government agencies more autonomous, hence the move by the opposition to remove this power from the government. The government however, tried one last time to delete the changes made by the opposition and revert to the initial provision. They were unsuccessful as the combined opposition voted to keep the changes they made. Additionally, the government, in Clause 2 (4) of this bill, attempted to insert a Regional Executive Officer (REO) in each NDC as it has done with the Regional Democratic Councils (RDCs). The opposition however, at the level of the Select Committee had voted against this attempt, and followed up on their decision when the government, last evening, proposed that REOs be inserted in NDCs. The opposition argued that the move by the government to insert REOs in RDCs have resulted in the elected officials being sidelined and said this might be replicated at the level of the NDCs. Further, Bulkan said that the bill, as laid by government, would give them the power to determine the rates, taxes and other fees to be collected by the local governing bodies, while AFC MP Moses Nagamootoo said that if the government has their way, the NDCs and municipalities would be required to seek approval from central government to carry out their operations. Minister within the Ministry of Local Government Norman Whittaker, however, said that it is important for government to play an important role in local governing bodies especially since it is central government which funds much of their operations. Whittaker also accused the opposition of hijacking the bill and said that their actions seek to dilute the authority of the Ministry of Local Government. Ultimately, despite their disagreements, the parties voted to pass the Bills.